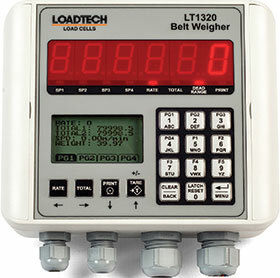 Loadtech’s LT1320 is a precision digital indicator for belt weighing applications. The unit takes the weight and speed information from a belt conveyor system and accurately calculates the rate and total of material transfer. The bright 6-digit 7-segment 20 mm LED displays and the sunlight readable graphic LCD make for easy setup and readability. A simple menu system allows for easy configuration of display and belt weighing settings. Load cell calibration can be done directly from the calibration certificate or by using dynamic calibration of the belt conveyor system. The LT1320 also provides an internal jumper selectable power supply for powering an encoder/tacho-generator and a pulse counting digital input to measure the speed of the belt conveyor system. A universal mains switch mode power supply (85-264 VAC) is provided as standard but an optional low voltage (10-30 VDC) isolated power supply can be installed. The LT1320 contains precision front end circuitry for high accuracy and stability. The ratiometric ADC circuitry automatically compensates for temperature drift and excitation voltage variances due to cable loss. The load cell excitation voltage is 5 VDC and can interface with both 4 and 6 wire load cells. RS-232 and RS-485 communications are supplied as standard with the Modbus RTU and Modbus ASCII protocol. A simple ASCII out protocol is also provided for serial printing and communicating to large displays. The LT1320 has circuitry to generate a precision 0/4-20 mA or 0-10 V analog output signal, and also includes advanced features such as a totaliser, dynamic tare function, auto-zero tracking, user input linearisation, programmable front push buttons, programmable digital inputs, security menu lockout, dead band adjustment, advanced digital filtering and dynamic calibration, all in one precision belt weighing indicator. Profinet interface added to Mettler Toledo’s popular weighing control system. The specialist for challenging applications with superior accuracy for mass, volume flow and density determination. Yokogawa’s bespoke custody metering solutions.